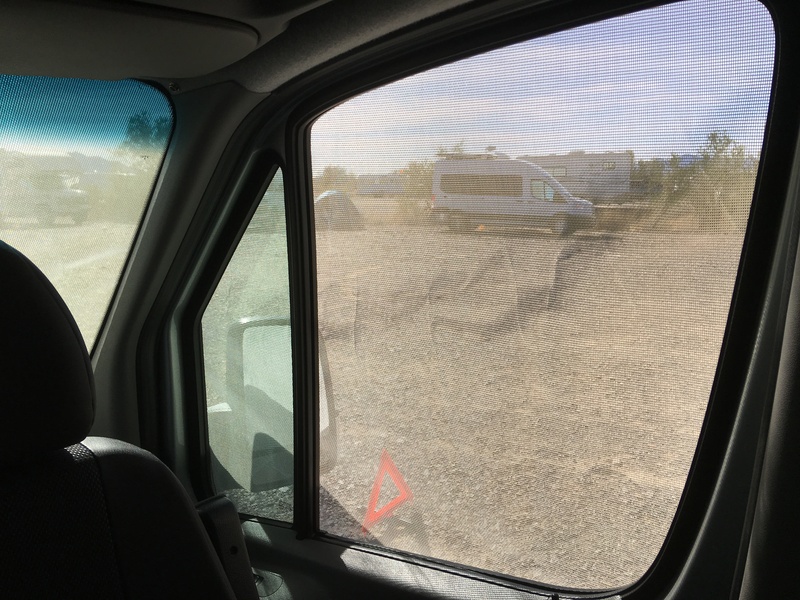 We thought some of you might be interested in this topic so we want to share our experience with our new SMB mesh windshield and cab window cover. In short, it’s great! We’re very happy with it both in terms of its effectiveness and construction quality. We’ve used vinyl windshield and cab window covers in the past on our prior SMB and never liked them very much. However, the perforated cover we got from SMB West for our 2014 Sprinter really works well. 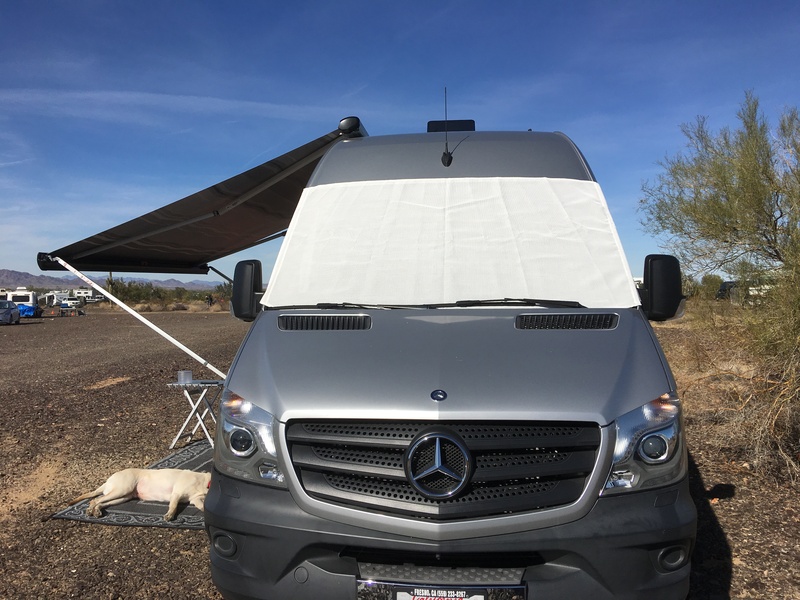 Until now, like many people, we used Reflectix panels on the inside of our windshield to try and reduce the heat entering the van through the windshield when camped in sunny climates. This greenhouse effect is challenging to try to combat even with Reflectix panels because the sun still passes through the glass and reflects off the Reflectix back into the glass making the glass super hot. This approach really wasn’t working very well because it wasn’t keeping the sun from coming through the glass in the first place. In an effort to combat this problem, we decided to take a chance and buy a perforated windshield and cab window cover from SMB. They are a bit pricy at about $164 but fit well and are very well made by the SMB fabric and upholstery shop. They also attach securely to the two front door edges with automotive style door edge clips. They are tailored for a snug fit so they don’t flap around in the wind and do a good job of providing insect protection on the two cab side windows so you can leave the windows down increasing the crossflow of ventilation through the cab. 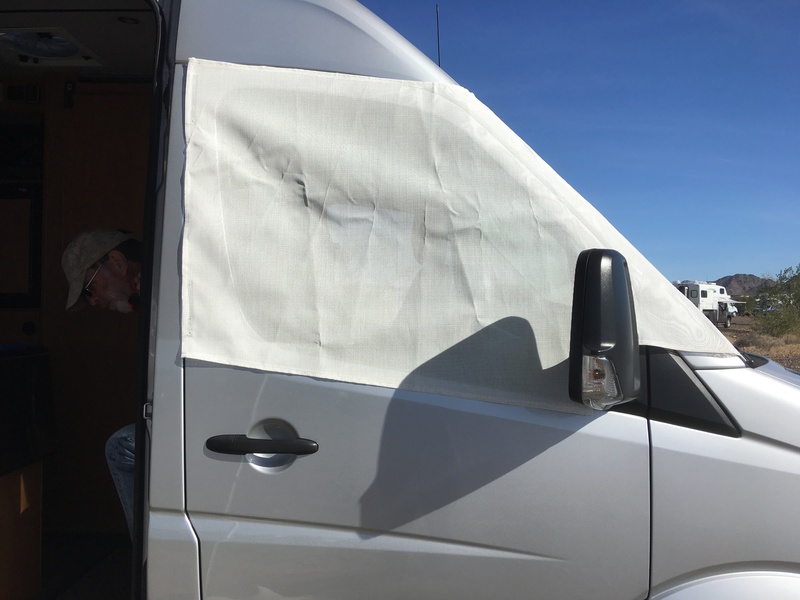 Also, due to the perforations in the cover, you can see out of the van through the cover while still providing a lot of privacy during the daylight. Best of all, drum roll please, it keeps the van much cooler than anything we’ve found so far. We just returned from 10 days camping in the Southern Arizona desert and it really did the trick. 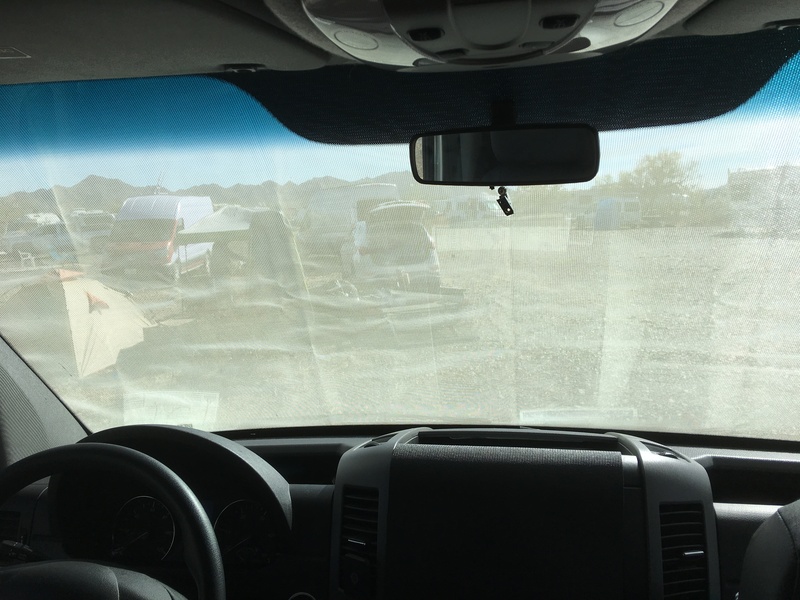 During the hottest part of the day the windshield glass only got mildly warm to the touch, not scorching hot like with the Reflectix panels. So, this product earns five solid stars with us. We highly recommend it if you might be looking for something to help keep the heat out of your van. Nice! Thanks for the review. I’ve considered getting one of these for a while now. May do it for this summer. Very useful info - I may pursue one from SMB as well. Had been using the reflective front window sunscreens, and you are on-point stating they heat the glass - so much so that i came back from an outdoor concert this past summer only to find the rear view mirror laying between the two front seats (van was parked void of any shade)- glass got so hot the mirror fell off! Curiosity begged me place my hand on the windshield to test my assumption - unbelievably hot!